Morano sat down in front of a Turkish TV camera to debate Massachusetts state senator Michael Barrett about President Trump's pledge to withdraw from the Paris Agreement. 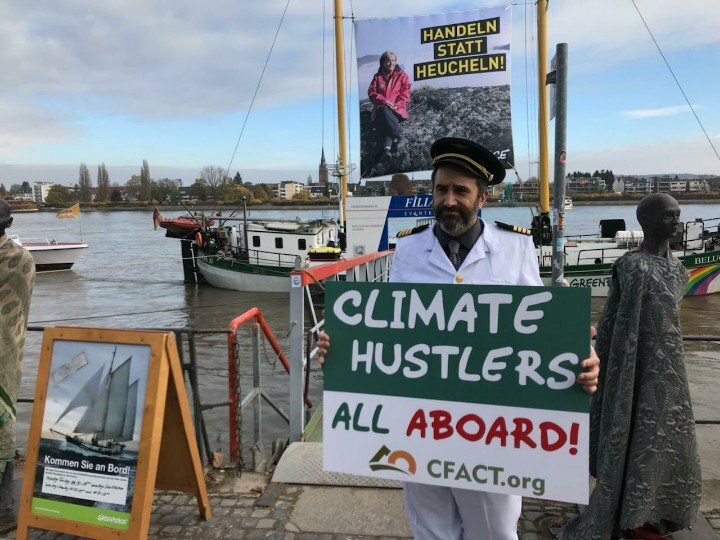 To fill his time this morning, Morano, who loves to play dress-up, donned a captain's outfit and mocked a Greenpeace campaign boat. Morano debunks 97% consensus, polar bears, extreme weather, predictions & much more. Watch Exclusive Video of marchers trying to interfere with skeptical banner. 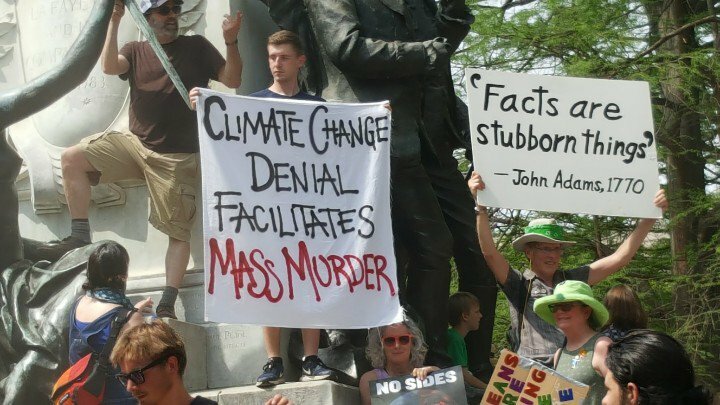 Morano on marchs' treatment of skeptics: It reached absurd levels when I went to get coffee at the hospitality table, everyone greeted me cheerily, but then a man came up and said “You know he is a climate denier.” The mood of the volunteers changed immediately after I was "outed." [“I've been "outed! I wasn't even "in"! “Not that there is anything wrong with that.” - Seinfeld TV episode] Just as I was reaching for the creamer, a lady picked up the box of creamers and recoiled back so that I could not have it for my coffee. It appeared for a moment that the People’s Climate March was going to take a stand and deny a “climate denier” cream for his coffee and refuse me service. I responded: “You are really going to deny me coffee creamer” because I am a skeptic? She then relented and allowed me two creams for my large coffee. Incident avoided, coffee enjoyed.